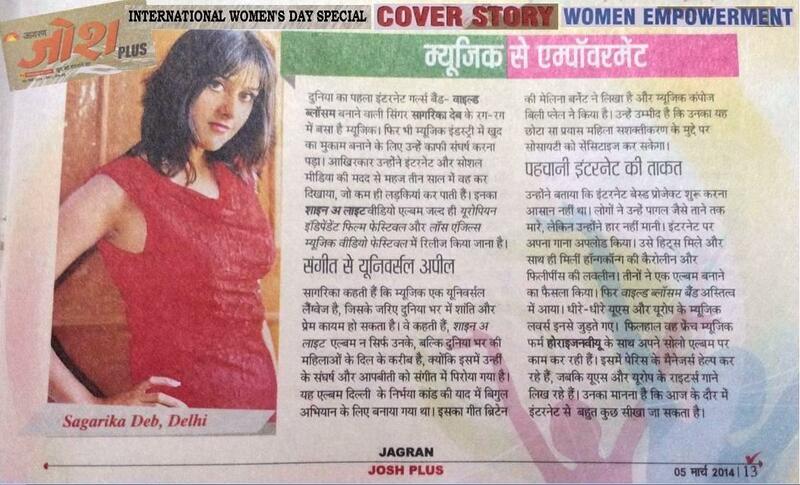 2 ‘Dainik Jagran Josh Plus’ Magazine – Cover Story for International Women’s Day Celebration! 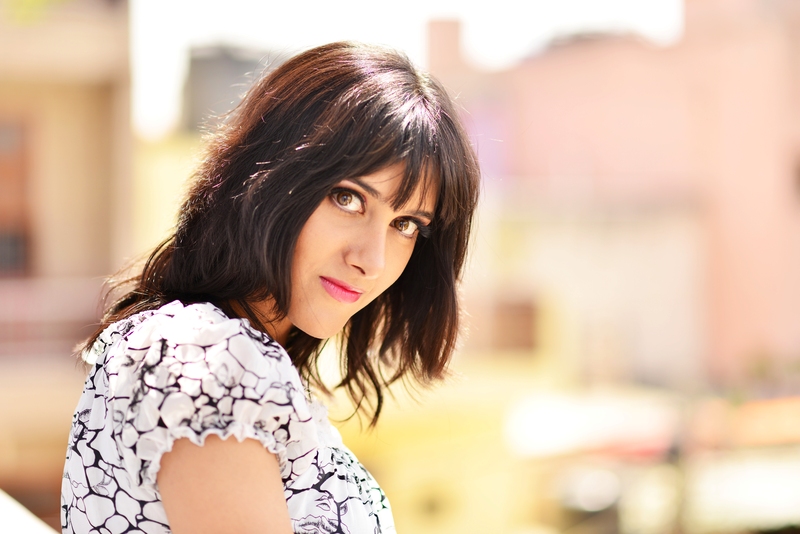 World’s First Internet Girl Band’s creator Sagarika Deb has music running in her blood. Still it took a great deal of efforts for her to make a mark in the music industry. At last with the help of internet and social media just within three years she is able to achieve what very few girls are able to do. 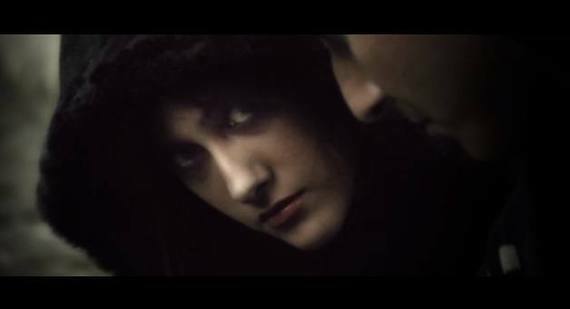 Her video ‘Shine A Light’ will be showcased in ‘European Independent Film Festival’ and ‘Los Angeles Music Video Festival’. 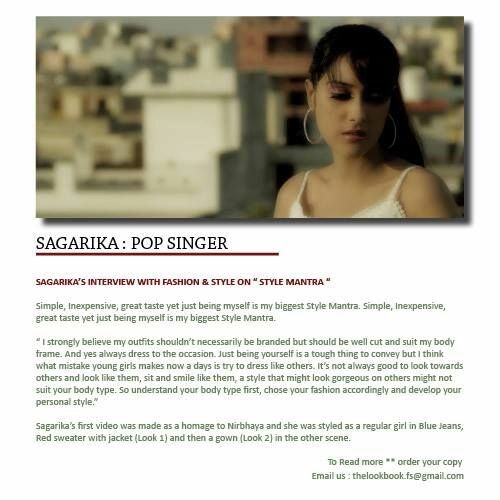 Sagarika says ‘music is a universal language through which peace and love can be spread in the world’. She continues, ‘Shine a Light’ album is close to not only her but to women all around the globe because it tells the story of their struggle through music. This album was created in the memory of the Nirbhaya case of Delhi, for the campaign Bigul. The lyrics are written by Mellina Barnett and composed by Billy Plyale both from Britain. They strongly feel that their small effort will sensitize the issue of women empowerment in the society. She said starting an internet project wasn’t easy. People at first taunted her as mad but she still didn’t lose hope. Uploaded her song on the internet. At present she is working on her solo music album with French music firm HorizonVU Music. Her Paris based manager is helping her along with songwritters from Europe and USA. She believes that a lot can be learned from the internet. 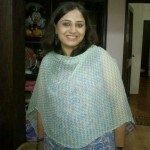 A brief introduction about yourself and what you do: I am Sagarika Deb. An oridinary girl from New Delhi with extraordinary dreams. I always had a great interest in the internet, social media and in using these, wanted to share not only my music but also important social issues like Women’s Empowerment and Animal Rights, another cause which is extremely close to me. The music in me and my love for the internet/social media helped me to create the World’s First Internet Girl Band, after that numerous media coverages and awards followed. Some of the most memorable being honoured as the “Top 10 Shining Faces/Young Achiever of the Year 2012” for Delhi/NCR by ‘Delhi Desire’, Dainik Jagran Group Magazine, being inducted in the prestigious Limca Book of Records for their music special edition and to be featured in the ‘BBC World News series ‘Digital Indians’. Who or what inspired you to become a Singer? A singer that has inspired me the most is my mother. I happen to come from a very musical family and my mother and sister are both brilliant singers. Ever since I first opened my eyes as a baby I heard my mother singing to me and later too I was so proud to see her performing on stage. I always wanted to be like her, she really inspired me. I have always got my inspiration from my mother and she always encourages me to aim high. Before my mother got married she lived in Kolkata, and living there was a very famous music teacher. He was truly gifted and very special, even more so because he was born blind. He once said to my mother, “If there is anyone to take the place of ‘Lata Mangeshkar’, it would be you”. So of course I cannot be asking for any other inspiration than in my own family, my Mother. Coming from a musical family, singing has always played a BIG part in my life. My first steps on stage were at the tender age of two and half when I dressed up as a beautiful Bengali Indian Bride and my sister acted as my groom. A musical act followed and I can remember being so excited to be part of it all. Even then I was a child with big dreams, and I knew there was nothing else I wanted more than to be performing on stage in front of an audience. Through the years I have won numerous certificates and awards for singing, dancing and acting. I have always been very passionate about mixing the styles and sounds of Western music with Indian music, a ‘fusion’. Luckily my musical abilities enabled me to build up friendships and contacts with some truly talented songwriters from different parts of the world. My confidence as a performer and singer has grown and I am more aware than ever of the singing career I wish to pursue. I have not looked back. Are there any famous singers that have influenced you down the path of your career? If I have to choose from any of the famous singers I will definitely be Enrique Iglesias. I just love his voice and the way his vocal timbre goes. My mother and sister are both brilliant singers. My parents have always told me to chase my dreams and most importantly, that there is no difference between a boy and a girl and that we are all equal. I am exceptionally close to them. There were times when I lost hope and was disheartened with the failures but my parents have always asked me not to lose hope and believe in my talent, believe in the power of the universe and spread a positive message. They totally understand my life, career and the pressure of being in the entertainment business. They are totally my comfort pillow on whom I can rely upon anytime without worrying about anything. The last three years of my life has been like a practical tutorial. I have learned how to work as a team – Now it is all about ‘WE’ not me. Everything I have been able to achieve today is down to a big team effort. The support that I have had from my management, songwriting team and family has been overwhelming. I have learnt that a successful artist wants and needs a team that can be relied on. After all, it is about trust, sensitivity and support for everyone involved. So now my team is like my second family. What plans do the future hold for you? I am extremely excited about the future, as my management and I are in the planning stages of my first Solo Album. The Album will consist of songs written specifically for me by songwriters from Europe and America. New album, brand new songs, and music videos and hopefully a musical concert tour will be in the pipeline. Also my latest music video, ‘Shine A Light’ will be featured at this year’s Prestigious ‘European Independent Film Festival’, also in the ‘Los Angeles Music Video Festival’ and many other film festivals across the globe. We hope to take our message of Women’s Empowerment everywhere around the world. Other than the unique monuments the different street food joints all around the city are also what make Delhi, ‘So Delhi’. I travel for work and needless to say I miss it a lot whenever I am out of town. One popular misconception about Delhi is people (especially outsiders) think “everything would be too difficult”. Everything will be very slow here and how sometimes the simplest task would be impossible. Sure it’s not completely like the developed states/countries however it is also not as difficult as people think it to be. They also think eating all the street food here would most likely get them sick. Interestingly enough, it’s not the case otherwise we all would have been bed ridden everytime with stomach problems. A Hidden gem of the city everyone must know about? The Delhi Green Ridge and the bird life found in it! The Delhi ridge protects us from the hot winds of the deserts of Rajasthan to the west, and is also responsible for earning Delhi the tag of the world’s second most bird rich capital. Since I am very close to nature it attracts me a lot and of course everyone should know about them and try to protect their natural environment with whatever means possible. Also I do feel Delhi has the potential to become a world class city. It has all the resources, talent, is the political centre and the capital of our country. We find all religion/communities, people, fool, culture, festivals here in Delhi, so in short you can see the entire India in this region. So for me it represents a ‘Chhota India’! Top 5 places to eat out in Delhi? What advice would you give to someone wishing to get into the Singing Industry? The biggest message I would like to give to aspiring singers is that there is no shortcut in life especially in the entertainment business. It can be very hard on your voice, riyaaz (vocal exercise) is important and should be done regularly as without your voice you have nothing. Although luck can sometimes come into play, true talent is recognised so never give in; share your voice where you can, the internet is super for this. Be prepared to take criticism, take advice and work hard. Always dream big, there is nothing wrong with that. Before anyone believes in your efforts you have to believe in yourself. Believe in your own strength, believe in the power of the universe and always spread a positive message. I always try to be the person I am, I won’t let anyone change me just to conform. Be kind but don’t let people take advantage of you. Everyone should have a dream, something wonderful to aim for. 0 An “Upbeat” Start to 2014! Yesterday was one of the best nights for me. I was in attendence at a “Page 3″ Party, with major socialites of Delhi! There were a lot of media and photographers present. 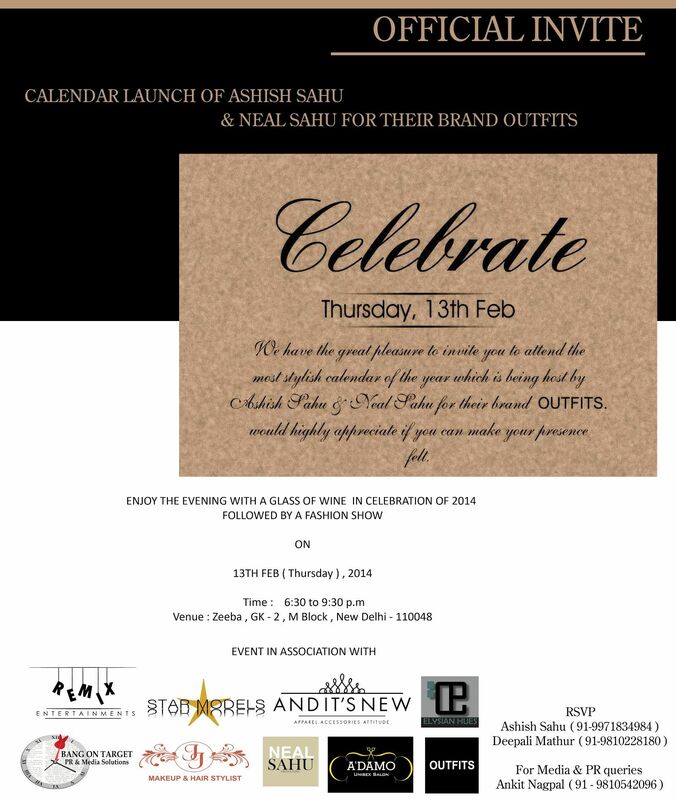 The calendar of Ashish Sahu was launched by one of the biggest beauticians of India, Shehnaz Husain and Sandeep Marwah. Everyone said they would like to invite me for their other events as well. They all want to attend my music shows, so now I am working hard to produce my stage show. It’s quite unbelievable and encouraging that in just few months people are getting to know me and they have started calling me to attend their prestigious events. I have given a really long interview to Dainik Jagaran Newspaper today morning for their ‘International Women’s Day’ celebration. It will be out on March 5th. All of this is thanks to all of you who follow me and encourage me to continue with my work. 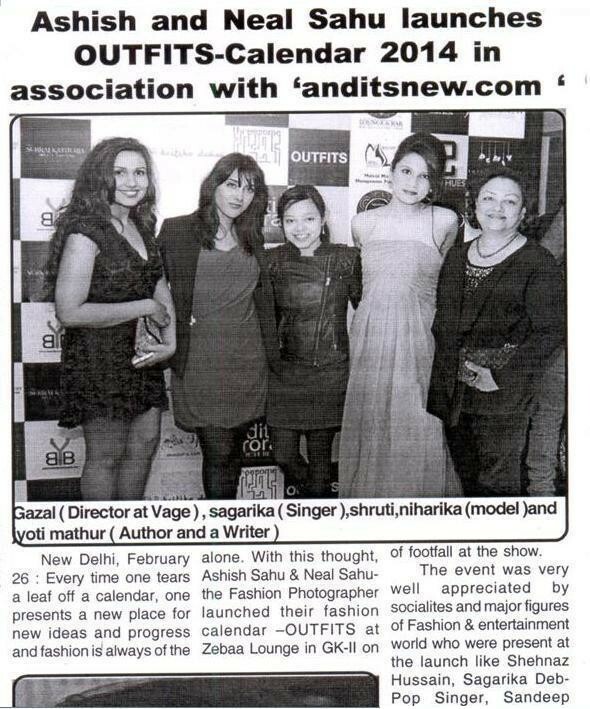 Sagarika will be attending the 2014 calendar launch of the Brand ‘Outfits’ by Fashion Designer, Stylist & Photographer ‘Ashish Sahu’. 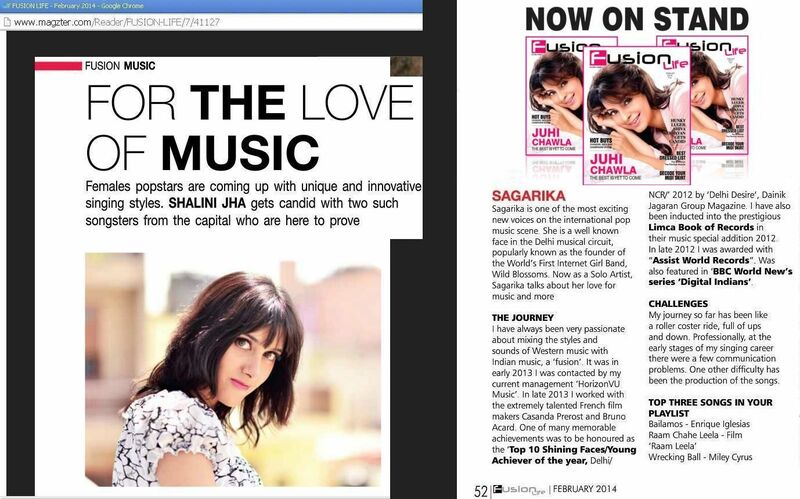 Sagarika gets candid with Fusion Life Magazine’s Shalini Jha.